These were my first felting needles and I must say, they are a great first choice. They are really sharp and the rubber makes them super comfortable to use. The colors help with classification. I think it is great how you put them all in a package. If you are considering these, get them. The idea for making the needles easier to hang on to is great- I had tried wrapping the end of a regular needle in vet wrap, but this is much better. I also appreciate the color coding. I LOVE Felt Alive’s Felting needles! They are pretty much all that I use. I love the soft handle that is just the right thickness! Color coding saves time. Totally worth it! Once you try these you won’t want any other felting needles! The doubles are terrific also! Just started felting recently and had purchased some needles from ebay. Then I got the super dupers. The difference was amazing! Also LOVE the color coding! These needles are so comfortable that I can felt with them for hours without feeling any strain. The colour-coding is brilliant, as I can pick out the right needle without having to check it first. A really good buy! love the Super Felting Needles, the rubber handles make it much easier to grip. I have used them and my fingers do not get as tired as with the needles with no handles. Received them in a timely manner and in perfect condition. Kay’s needles are fantastic. This pack has just the right needle for your basic felting needs and the rubberized grips are the best idea ever.I LOVE them! Thanks so very much. These needles are wonderful for felting. I like the well designed handles the most. Thank you. The color coding is the best. When I am working on a sculpture with a bunch of different parts I switch the needles out for different uses quickly. I use the 40 T the most. The pack is a better choice than buying them individually and they are cheaper than what the local craft store carries, even with shipping; plus they have handles. Love these needles and the gripper. I love these needles. I don’t use anything else now. Since I teach needle felted marionette making for a Waldorf inspired public school, I thought I would give them a try for my students this year. Although my second track Handwork teacher did not like them, I do! I made a pack to hold them all in, with the students numbers written on each pocket, and so I love the color coded handles for quick grabs. The students also feel special, as I explained how I bought them, for them, this year for the first time. We are all having a wonderful time stabbing away!!! Very happy with the needle pack. Comfortable to use and color coding is helpful to the novice needle felter. And a reasonable price, too! Love my new needles! Comfortable to use and high quality. I just started needle felting and had tried a few needles from craft stores, but all of them were terrible. I decided to try Felt Alive’s needles and was completely amazed! These needles work like magic, are super comfortable to hold, and are a thousand times better than the lousy stuff at Hobby Lobby and other craft stores!! Before I wasn’t even able to get a ball to stay together; with these needles I was able to make a complete lifelike chickadee in 2 days. I really cannot say enough about how amazing these needles are. If you are hesitating, stop hesitating and get them. They will completely change your needle felting life. I have been needle felting for some years and have tried needles from different sources. No more! These are the best. Not only are the handles comfortable, you can actually feel the quality when you use them. I’ll be recommending these and Kay’s other products to my classes from now on. Thank you Kay! I love these needles! They make all the difference! I am only going to order my felting needles from Kay! I have ordered more items from her and the shipping was fast and I am happy with all of her products! I even received her Droit Workshop DVD for xmas! Loved it and made my first Droit that same day! Thank you KAY! I very much like the comfortable ends. Was very disappointed with the yellow 40 needles. Both broke within a very short time (not due to abuse). They seemed to be more brittle than any other brands I have used. The black 36 and red 38 were very good. These are the best needle I have tried. They penetrate the wool smoothly ensure quick felting. Others I have tried appear blunt compared to these very sharp needles. The rubber grips make felting very easy. I love using these needles. Their comfortable, their strong, and the color codes make felting so much easier. I won’t be without them! While I am really pleased with the needles comfort and feel that they work better than other needles I have used, both of the yellow 40 needles broke within a week of receiving them. I wrote an email explaining this and have not received an answer. I will continue to purchase wool from FELT ALIVE but perhaps not needles. Very impressed with the needles and the comfort offered by the molded grips. Great buy!! These needles are really easy to work with…no more sore fingers! I will def buy again! Haven’t broken any needles despite being a beginner! This is the 2nd set of these I have ordered because I just love them soooo much!! I wanted to have an extra set on hand!! Totally love them!! I am new-ish to needle-felting, and these were the second set of needles I bought. The first was a nice set of four, but they did not have the cushioned grips on them like these do and I have to say: The grips make a huge difference!! So comfortable to hold, they don’t slip down my fingers while I poke away, and the colours are super helpful at finding what I want quickly. Highly, highly recommend these! Amazing! I was on the fence about this purchase but I am so happy I went through with it. If you are not sure if it is worth it, It is. Go ahead and treat your self. While I am very new to needle felting I am loving the craft. This kit only makes me love it more. With these needles I am making dolls faster, and more efficient than I could have ever done with the needle I was going to buy from Michaels. The price is way better than store bought as well. 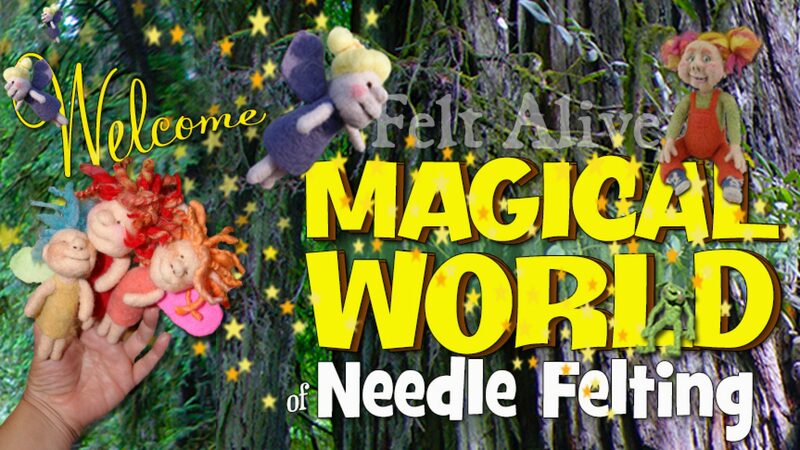 I have only good things to say about not only these needles but feltalive in general. I even left a comment asking for advise as I could not find the color I needed and they included a very small sample for me to try. I am now a customer for life, Thank you felt alive. I love using your wool for doll making! It’s easy to work with and the quality has always been consistent. Thank you!